Editor’s note: We experienced some accuracy issues with data entry into a Google Spreadsheet shared among several people for some of the later results. They’ve been corrected, but these should still be considered unofficial results. Early returns of Ann Arbor city council races based on paper tapes from precinct locations are published here with the most recent updates. Results here are unofficial. For unofficial results compiled by the Washtenaw County clerk’s office, see: Election Results. With results from 4 of 8 in-person polling locations informally reported, Briere has received 592 votes (67.4%), Hayner has received 274 votes (31.2%), and Vresics has received 9 votes (1%). Democrats gained ground in local elections on Tuesday, but two high-profile Ann Arbor ballot initiatives were defeated. 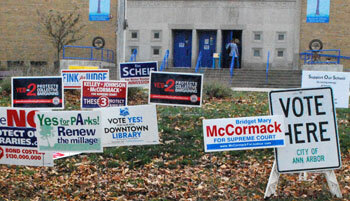 Campaign signs outside the polling location on Nov. 6 at Eberwhite Elementary School in Ann Arbor. Voters rejected a public art millage and a $65 million bond proposal for a new downtown Ann Arbor District Library building. But renewal of a millage for park maintenance and capital improvements won overwhelming approval. In countywide races, Carol Kuhnke of Ann Arbor defeated Jim Fink of Ypsilanti for a judgeship on the 22nd Circuit Court, replacing Melinda Morris, who is retiring. Incumbent judge Tim Connors retained his seat over challenger Mike Woodyard. The Washtenaw County board of commissioners will see changes following Tuesday’s election. Incumbent Republican Rob Turner was defeated by Democrat Kent Martinez-Kratz, decreasing the number of Republicans on the nine-member board from three to two. Republican Alicia Ping won the District 3 seat over Democrat Wes Prater – the two incumbents faced each other due to redistricting that took effect with this election cycle. Other incumbents won their seats, as did Democrat Andy LaBarre, who secured his first term on the board. Democrats prevailed in all local races for the Michigan House of Representatives, most notably with Gretchen Driskell – the current mayor of Saline – defeating incumbent Republican Mark Ouimet in District 52. Editor’s note: The preliminary partial results reported here are superseded by unofficial complete results, which can be found in The Chronicle’s Civic News Ticker. To give a sense of how the Nov. 6 general election in Ann Arbor is unfolding, The Chronicle is reporting early returns from absentee ballot counts and individual precincts as the tallies become available. 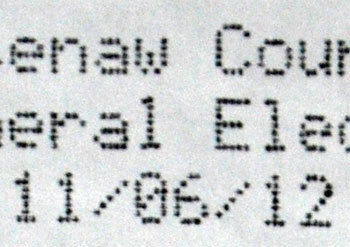 From the header of the dot-matrix-printed results tape from a voting machine. We’ll be updating this report over the next few hours, so check back for additional results. For results on these and other races throughout Washtenaw County, check the county clerk’s elections website. 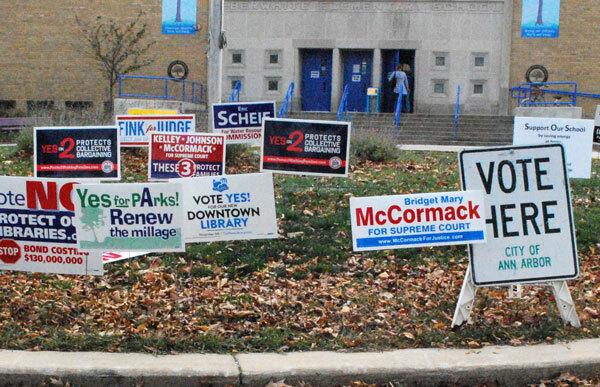 And look for a complete Chronicle roundup of outcomes on Ann Arbor elections and ballot proposals on Wednesday morning. Results below are refreshed without preserving previous interim results. Results below are for 4-4, 4-8, 5-5, 5-6, 5-2, and Absent Voter Count Boards 3, 5, 9 and 11.